After spending around 30 hours on research (consulting experts & manufacturers) and testing 20 different models of tile cutters, we found out that QEP 10900Q is the best tile cutter for the money. It is very durable, corrosion resistant, light-weight and provides accurate cuts on both large porcelain and ceramic tiles and provides unparalleled performance while in operation. We came down to 5 of the best choices for you after testing around 20 different tile cutters. Here's a quick comparison of their important features and price. This is a diverse list with the tools having varied functions and cutting ability. All of these are top choices based on our tests and expert opinion, so you won't go wrong any way. If you are a professional woodworker, we are pretty sure you want to dig more than just have a look at our quick picks and learn more about individual tile cutter in detail. Rest assured! Since we have shared all our test results and comprehensive reviews below, so you can choose the one that suits your exact requirements. The QEP 10900Q is a top of the line tile cutter, and it’s an all-round tool. It has a 7/8 inch scoring wheel with titanium coating for accuracy. This tile cutter can also cut through ceramic tiles and porcelain (up to 24 inches and 35 inches diagonally). The cutter also comes with an adjustable straight edge guide which you can use for precision cutting. Here the cutting wheel really comes into play as it ensures scoring is durable and smooth. The cutter is not just simple to use but easy to clean. Once you’re finished for the day, use soap and water to clean. If you have an air compressor, that will do fine as well. 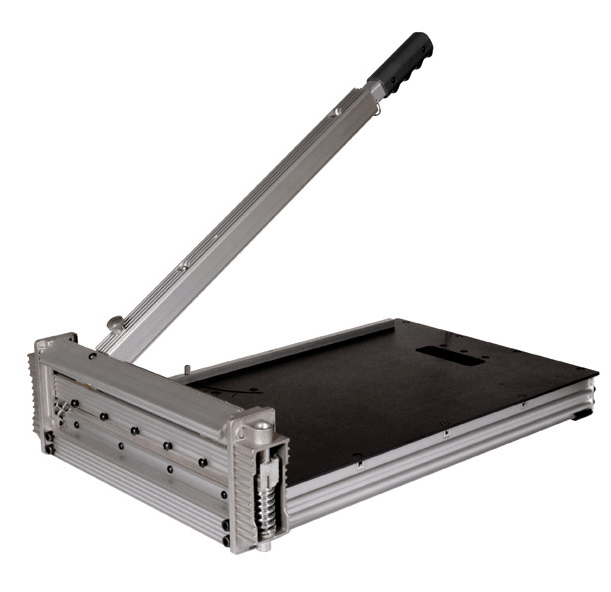 The cutter is equipped with cutting table extensions, rubber pads and a generously sized aluminium alloy base. All of these features make the 10900Q ideal for large tiles. Unlike other tile cutters, the 10900Q is stable and won’t wobble. The package also comes with a bicycle grip handle for convenient use. It has dual chrome-plated rugged steel rails which makes it super durable and prevents from corrosion. The linear ball slides along for the smooth operation on tiles of any size. The QEP 10900Q even has side arm extensions that support large tiles. We noticed that the aluminium alloy base had heavy duty rubber pads which helped to stabilise the cutter. Even after doing around 500 sq. feet of cutting, the scoring wheel showed no signs of degradation. It is very light-weight and has a compact size which makes it really easy to carry along at work or other places. Plus you can easily clean it using an air compressor or just soap and water. Overall, the build is very sturdy and we can say it's a strong tile cutter to own. The 10900Q was designed specifically for porcelain and ceramic tiles. Few Things We Noticed: The score and snap mechanism is simple but effective. The cutter is effective for both small and medium tasks, but is especially suited for large tasks. The large bicycle grip handle made of rubber makes the cutting very smooth and effortless. We used it for tiling a bathroom including the floors, walls and the ceiling (on large format of ceramic & porcelain tiles) and it did a great job. Again we used it for cutting 8x32" wood grain tiles and it gave great results. Next on a bathroom remodel and we cut 12"x24" tiles and the sharp cutting wheel again performed as expected. It did make straight as well as diagonal cuts easily however the only point where it didn't work was when we tried making a diagonal cut on a 24" porcelain tile. Not good for rubber tiles over 1/2"
This multipurpose tile cutter which has Ishii engineering embedded in itself is a great one if you want a long term performance cutter. It scores in a very smooth way and you can even use it on large format tiles. 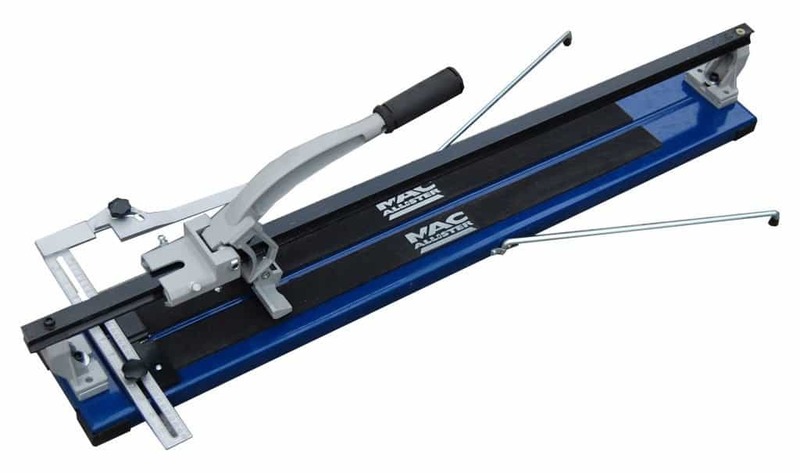 This porcelain tile cutter is powerful and built for heavy duty use. It is equipped with rubber pads and a die cast aluminium base, and the cutting wheel is tungsten carbide with titanium coating for reliability. 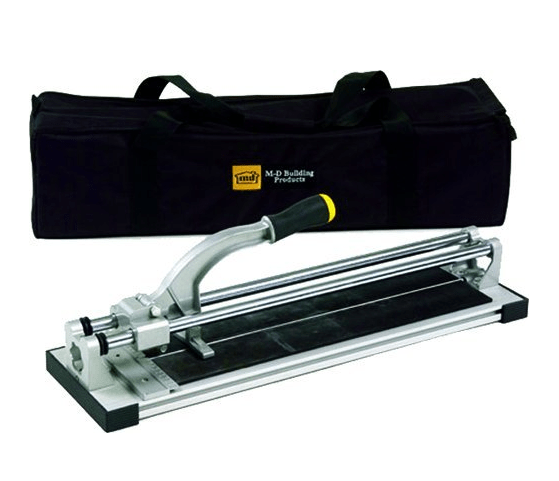 The Pro Porcelain Tile Cutter also comes with a comfortable grip handle. 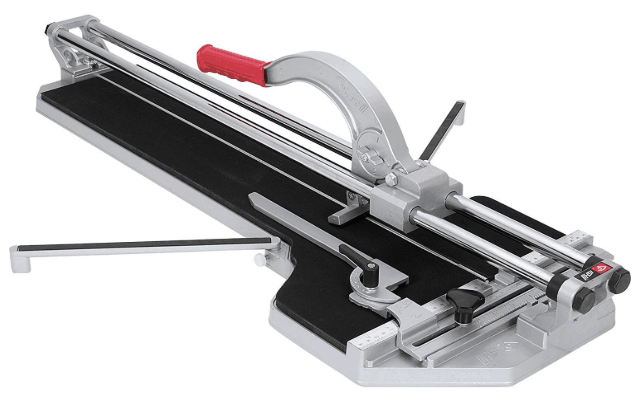 It provides the Pro Porcelain Tile Cutter – and the user – with greater leverage. Not only does it make the cutter easier to use, but it also minimizes fatigue. The cutting wheels are well-designed (adjustable to 4 different heights) and look like they will last a long time. However when the time comes you need a replacement, it’s quick to order one. If you’re looking for a good ceramic tile cutter, the Pro Porcelain Tile Cutter is as good as any. It is a versatile tool that you can use to cut ceramic and porcelain tiles. It cuts tile and floor up to 24 inches and it’s also effective on ½ inch thick diagonal tiles and cutting tiles up to 18 inches. No matter what you’re cutting the cutter remains balanced thanks to the base. We used it one of the master bath remodels and cut 12x24" porcelain tiles and it worked great. It could support large tiles and the small strips as well. The linear ball bearing slides and dual chrome-plated rail bars contribute to dependable scoring. Apart from the chrome-plated rail bars, it’s the aluminium alloy that ensures the unit remains stable. 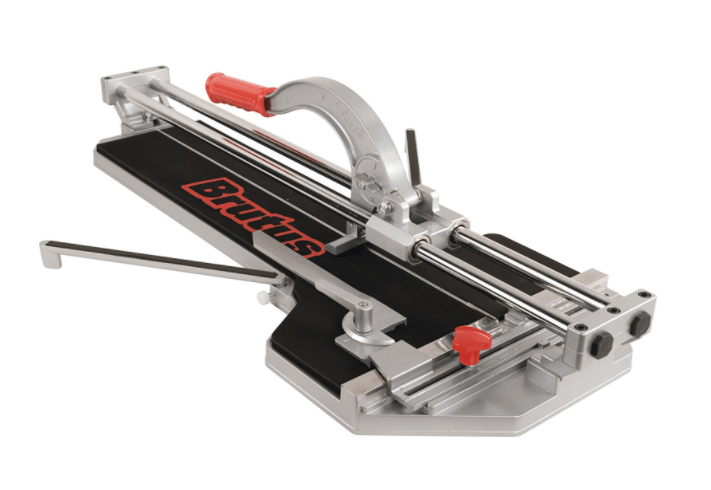 The Pro Porcelain Tile Cutter is meant for long term use. The cutter doesn’t encounter any problems either when it comes to hard tiles. You can adjust the wheel height four different ways so it does not get in your way. The 10630Q earns a place in our list of the best ceramic tile cutters. One of the things we like about this its solid construction. On top of that, setting this beast up is easy and cutting through tiles takes very little effort. The unit works fine out of the box so to speak. But if the time comes you need to make adjustments, it is easy to do so. The 10630Q shares some features with the other QEP products, and this includes being easy to clean up. Most of the time compressed air is enough to remove dirt, but you can also tidy it with soap and water. One of the more important features on the 10630Q is the table extender. Nothing is more frustrating than running out of room while you’re cutting. With these extensions you’ll be able to work with large tiles comfortably. There are a lot of other features we can add, but what it really comes down to is this is a high quality cutter. The 10630Q is designed for 24 inch porcelain and 16 inch ceramic tiles, both of the diagonal types. The cutter is equipped with a measurement utility so you can cut tiles with precision. Like the other QEP cutters, the 10630Q comes with a specially coated cutting wheel for reliable scoring. Porcelain and ceramic are cut using a score and snap procedure. You can use this cutter for various tile cutting projects, and whether it is large or small the cutter should be able to go through them quickly. M-D tile cutter is one of the best ones out there, and they’re well-deserved. It is constructed from solid materials, indicating it is meant for heavy duty use. The base is constructed from extruded aluminium and designed so it doesn’t chip, crack or break. The built-in guide is very useful when making diagonal cuts. The cuter is easy to use, but you do need to exercise caution so the score is over the middle of the cutter prior to snapping. Unlike those on other cutters, the guide remains in place and is accurate. With all the features on the M-D, it’s powerful enough to be used for extensive renovations, i.e. tiling up your kitchen. The M-D is also equipped with a ball bearing carriage, and this is the feature that ensures operation runs without a hitch. The cutter is designed for professional use by contractors, it cuts through 20 inch square tiles with a maximum thickness of 5/8”. Because the cutter is light you won’t feel fatigued during or after use. The aluminum base and the chrome rails contribute to its efficiency. In spite of its power, the M-D is easy to use. You can use it to install irregular porcelain tiles, and operation is straightforward. The M-D in particular is good for straight cuts and as we have mentioned this is also good for diagonal cuts. The time it takes to do cuts depends on the material. But as per the instructions there is no need to score more than once. And there really is no need for it as the M-D cuts clean each time. Bottom line: snapping and scoring is easy here. In terms of performance the Pro Flooring Cutter is equal to some of the best electric tile cutters we have seen. Its cutting power can go through a wide range of materials. The cutter, fashioned like a guillotine, is built from solid materials including an extruded aluminum foundation. The surface is plastic to ensure it doesn’t wobble. In addition the cutter comes with an adjustable handle that provides you with the leverage necessary for cutting. It is this feature that allows you cut in comfort. The blade is 13 inches, sharp and constructed for heavy duty use. When it does get worn out you can replace it quickly. The Pro Flooring Cutter has a guide which locks and swivels, essential for precision angle cuts. This guide is easy to adjust and helps maintain square cuts. One of its more notable features is its lack of noise, and compared to other saws it doesn’t make a mess. The Pro Flooring Cutter is an all-around tool as it cuts through foam, rubber and engineered wood tiles. You can also use this to cut laminate, VCT tiles, vinyl siding and vinyl flooring up to 5/8 inches thick and 13 inches wide. No matter which tile you cut, the edges come out clean and precise. The cutting table is large, ensuring stability for lengthy planks. We also like its extended handle as it allows for additional leverage for extra cutting power. The additional leverage is useful for engineered wood and laminate cutting. This is also what makes it easier to cut various tiles. Out of our top 5 picks, we have concluded that QEP 10900Q is the best tile cutter based on our tests, observations and expert opinion. Each one of the products we reviewed are versatile and designed to handle a wide range of tasks. Let’s admit it, choosing the right tile saw is a difficult and confusing task. 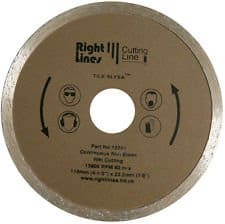 Keeping that in mind I decided to personally write the simplest buying guide for tile saws using which you can easily narrow your search and choose the tile saw that suits your needs from out top 7 picks. An appropriate tile saw can take away a lot of burden from your shoulders and can benefit you in multiple ways.A tile saw is a uniquely designed, safe and easy to operate power tool that helps you to cut any kind of natural or man-made tiles (porcelain, stone, ceramic etc.) with ultimate precision and proficiency. Overload Protection. A good tile cutter will act as a safeguard for burning and overheating. This feature is essential if you’ve got a direct drive motor model. Most units have this safety feature but it’s best to check the product specs. Blade Torque. Blade horsepower determines what types of tiles it can cut. Tile cutters with .5 HP or less are ideal for thin, small tiles. If you’re going to work with bigger tiles, look for the best wet tile cutter with more power. Adjustability. How easy is the blade to adjust? Most of the time you’ll need to do mitered and beveled cuts. If you’re going to do this, make sure the cutter has the right attachment. Blade Capacity and Adjustment. Blade capacity determines how well the cutting head can work with different blades. If you’re going to use just one type of blade this won’t be an issue. But if you’re going to work with various blades this will be necessary. Generally speaking, the more varied tiles you work with, the more blades you’ll need. Blade Type. There is an assortment of blade types to choose from, and they’re sold online. A dry/wet blade is compatible with a portable wet tile cutter, and you can use it for dry cuts. For wet cutting you’re going to find wet diamond blades the most useful. Note that wet diamond blades are only for wet cutting. Whether it’s the best glass tile cutter, ceramic or porcelain, you need to know how it works to get maximum performance. The following is a general guideline, but refer to your instructions manual as well. Place the wet tile cutter on an even surface. Pour water into the cutter’s reservoir. Make sure the water pump is immersed completely. Place the tile on the table. Make adjustments to the fence so the blade corresponds to the area where you want the cut to be. To cut diagonal tiles: place a speed square or miter guide between the fence and tile. If you want to do partial cuts, position the tile similar to a complete cut. The only difference is you set the tile as deep in the blade to get the depth you want. Turn on the tile cutter. If the tile is properly positioned you can turn the switch on. Start feeding the tile in the cutter slowly. When you are done, turn the cutter off. Prepare any additional tiles you want to cut before turning the cutter on again. If you’re looking for the best porcelain tile cutter, you’ll have a better chance if you know the different types of tile cutters available. Dry Handheld: Does not come with a water motor. Good for multiple cuts but can overheat. Wet Handheld Cutter: Does not overheat but needs water to do cuts. Wet/Dry Cutter: Can be used with or without water. These are ideal if you want smooth results when scoring a large tile or have to do multiple cuts. These tile cutters have large blades that make them the suitable choice for working on thick tiles. Their depth capacity is also larger than compared to other tile cutters. 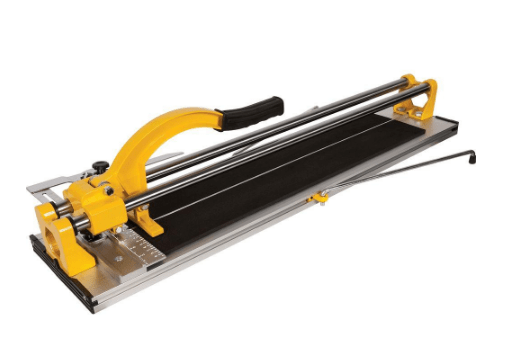 What Type of Tile Cutter is for You? Get a manual tile cutter (called rail or snap cutters) for small tile jobs. You just put a tile on the unit and move a scoring wheel on the tile, snapping it. 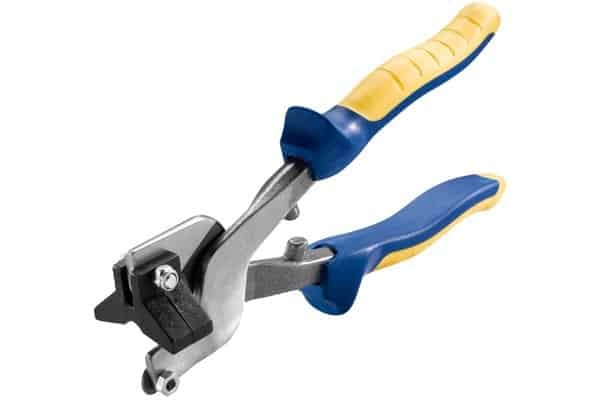 These cutters are most useful for window ledges and bathroom tiles. They’re also good for other types of tiles except for hard ones like stone. Just make sure the rail cutter is big enough for your tiles. You will also find these useful if the tiles are under baseboards or on walls. If you need smooth and precise cuts, chrome plated steel rails will be necessary. A handheld wet tile cutter is appropriate for cutting large and heavy tiles. You need to grab the saw firmly and move it along the tile. A container filled with water is connected to the cutter, preventing dust from flying all over the place. Handheld wet tile cutters are the most ideal for work on the kitchen and bathroom tiling. A handheld cutter can also be used to make custom cuts on almost any tile but stone. 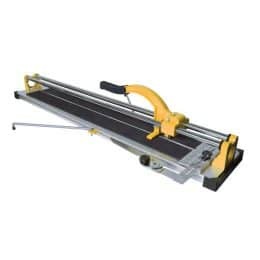 You will need a table top wet tile cutter for complex projects that necessitate feeding and holding several large tiles in the wheel. If you’re going to buy one of these, make sure there is a drain plug for easy water disposal. Tabletop cutters are great for large projects, but they’re not the most accurate. They are also likely to produce some friction. As long as your project doesn’t require a high degree of precision, these will do. An overhead tile cutter is also ideal for large projects. The difference from the tabletop is they’re more accurate. However, these units have to be assembled, and they are also the biggest tile cutters available. Most of these cutters also come with lights or lasers for extra precision. Get one with a mechanism that allows for delivery of fresh water, as that is essential for superior cuts. Final Words – Over to You! ​When we created review guide, we took into consideration all the factors that buyers would look for. We know that all tile cutters have their own pros and cons, but we spared no effort in choosing only the top of the line products. Considering how many options are available, it’s easy to get confused. With our review guide, hopefully you now know how to find the best tile cutter (handheld, table top etc.) or whatever model you prefer. No matter which among the five you chose, we’re confident of the results. The ultimate source for the best tool reviews, Woodworking tips and my favourite DIY projects. I hope you have a wonderful experience here. Pro Tool Guide is a participant in the Amazon Services LLC Associates Program, an affiliate advertising program designed to provide a means for sites to earn advertising fees by advertising and linking to Amazon.com.